What if you could bottle up all the sweetness, love, and joy that make your wedding day one of the most special and memorable days of your life? What if you could somehow squeeze all those grateful, blissful feelings into a priceless glass jar and send one home with every person who came and shared your wedding day with you? Vermont Maple Direct can make that happen for you! 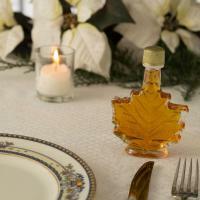 Our Maple Syrup Wedding Favors are the perfect complement to the wedding you’ve always dreamed of. Produced and packaged to order on our Vermont family farm with all the care and commitment you’d expect from the most extravagant wedding. Choose from a variety of glass jars in distinctive shapes and sizes, each adorned with your custom tags, and filled with pure, Vermont, rich amber maple syrup. Your wedding guests will feel like they’re the ones that just got married! 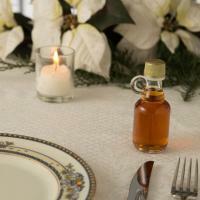 Maple Syrup Wedding Favors available in Grade A: Amber/Rich pure Vermont maple syrup only. Custom tags available from Vermont Maple Direct, or supply your own. Contact at least three weeks in advance for custom tags.